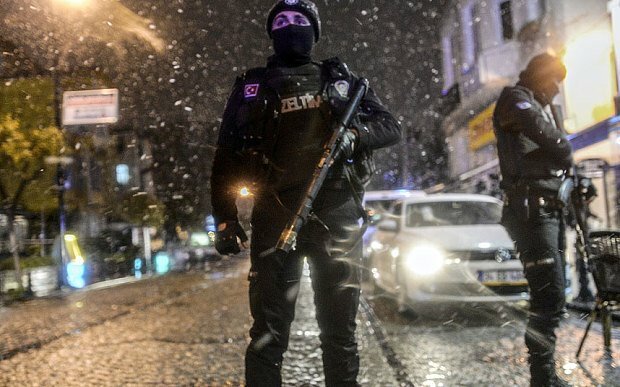 A female suicide bomber has attacked a police station in the tourist hub of Sultanahmet in Istanbul, Turkey, injuring two officers, the city governor says. Reports say one of the officers has died of his injuries. Governor Vasip Sahin told Turkish TV that the woman spoke English with “a thick accent”, but her nationality and identity remained unknown. No group has yet said it was behind the attack, the second on police in a week. Police arrested a man who threw grenades and fired a weapon at officers near the prime minister’s office on January 1, but no-one was injured in the attack. The bomber in the latest incident was reported to have died in the attack. Police have sealed off an area in the historic district, where the Blue Mosque and the Hagia Sophia museum are located. Vasip Sahin said the woman entered the station and told police she had lost her wallet before detonating the bomb. The banned Marxist DHKP-C group said it was behind the earlier attack in the city on January 1, which took place outside Dolmabahce Palace.